Perhaps no other bird has become as familiar to the average citizen through the cartoon medium as the roadrunner. This desert-dwelling bird's scientific name is Geococcyx californianus, the latter word designating him as a California native. The former word refers to the bird's genus, meaning "earth cuckoo." Roadrunners are members of the cuckoo family, but unlike other members of this genus they seldom fly. 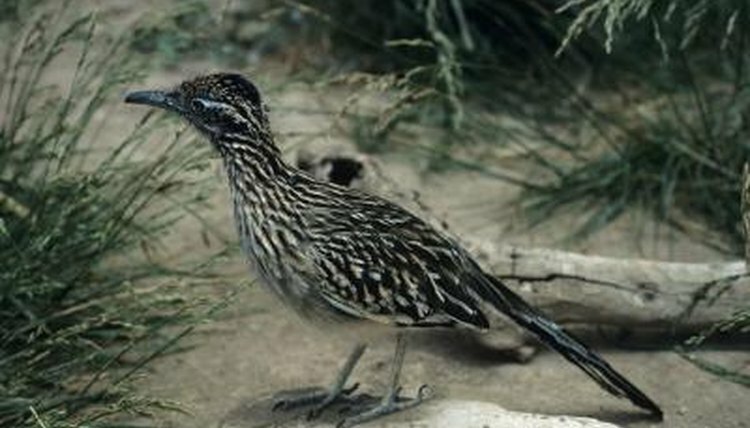 As ground-dwellers, roadrunners eat snakes, lizards, insects, eggs and smaller birds. Roadrunners also munch on carrion, or dead animals. They, in turn, are prey for bobcats, wolves and -- you guessed it -- coyotes. To escape predators, roadrunners can reach speeds exceeding 18 miles per hour. Roadrunner habitat includes much of Mexico. In Spanish, this bird is known as Correcamino californiano. French speakers refer to the species as Grand Géocoucou.